Two and a half years ago, I made this. Cotton quilt top and fleece bottom. No batting, no quilting. A quilt for corner-cutters. Oh my goodness, how delicious was she?? As it turns out, my handiwork was shoddy: every time we wash it, another seam pulls apart. I bet I’ve stitched up (with big, ungainly, totally visible stitches) a dozen or more gaps. As it turns out, that doesn’t matter. It’s everybody’s favorite blanket. I snuggle under it every morning and evening (and a fair amount of time in between). The kids fight over it. Its surface seems to attract books. The other day, I was thinking about how Valentine’s Day is approaching, and although I seldom do seasonal decorating outside the Advent-Christmas stretch, I was walloped with a wave of desire for pink. Pink pink pink. I remembered all the yummy rosy fabrics stuffed in bins in my messy laundry room/storage area—bins I pretty much haven’t touched (except to shuffle them from place to place) since Huck was born. 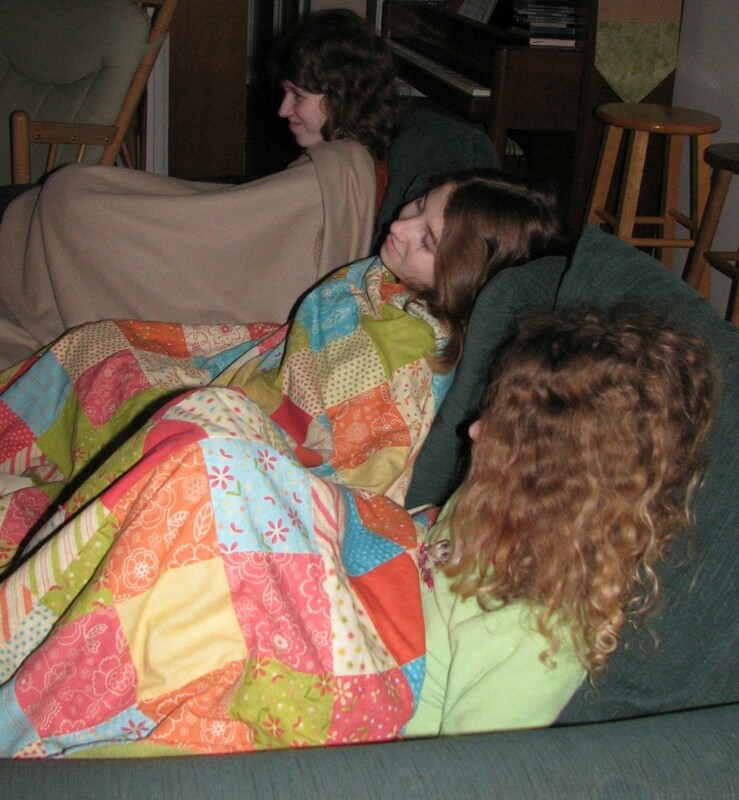 We should make another snuggleblanket, I decided. And by “we,” I mean I intend to foist most of the work upon my offspring. 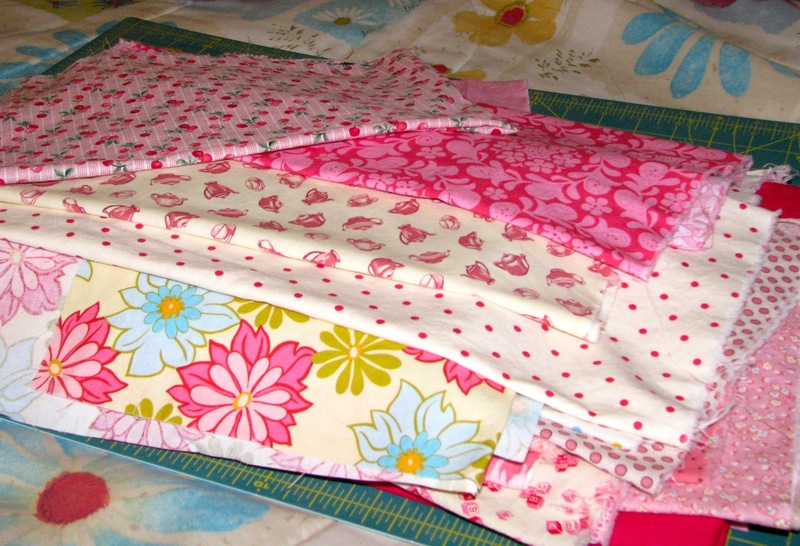 Step 1: Assemble all the pink fabrics in the house. Check. 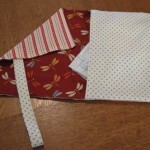 It really doesn’t matter if seams pull apart … or it’s not perfect. 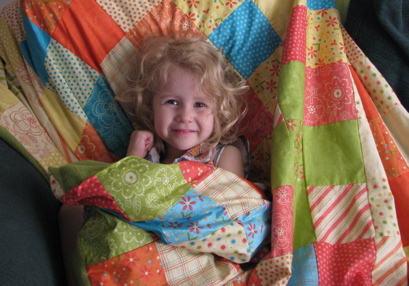 What our kids see is the love and not the fabric (or yarn, in my case). You should see the horrendous “T-rex” I made my now-13yos … it looks more like a manatee with blood-shot eyes (ok, I was knitting/designing it during my first miscarriage) … but he could care less. He loves that thing simply because I made it! 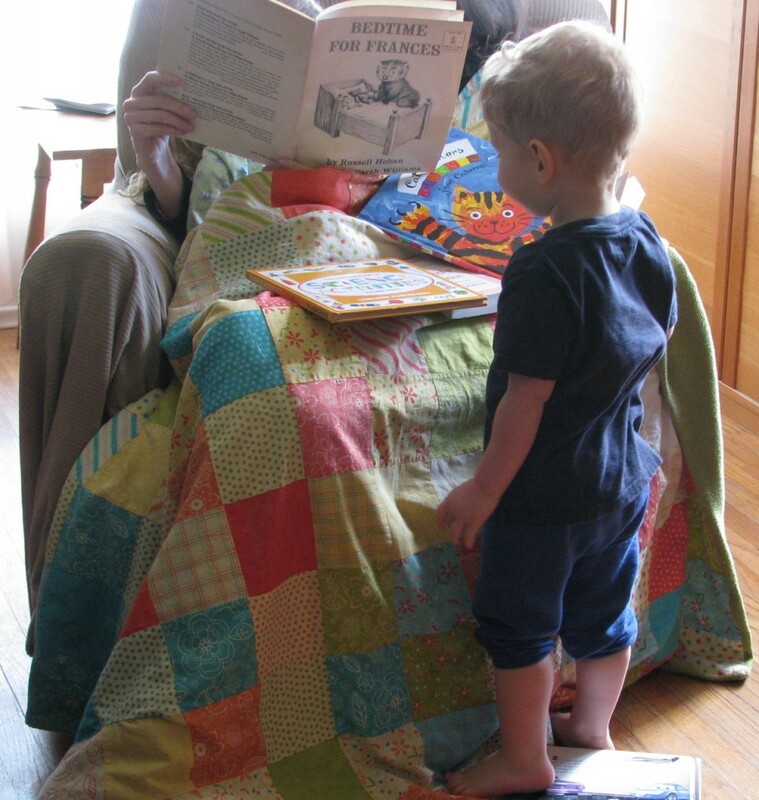 It’s time to find the book “The Quiltmaker’s Gift.” The pictures of the quilts are mouth-watering and the story is sweet. I can’t remember if I’ve seen you blog about this one before or not, so I thought I’d mention it. There is a book of the quilts from the book, too.